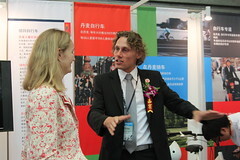 The Consulate General of Denmark in Shanghai is organizing an exhibition on Danish bike culture in Shanghai from 4th to 7th May 2011. At the exhibition, visitors have the opportunity to meet and talk with Mr Niels Hoé-Svendsen from the Cycling Embassy of Denmark about Danish Bicycle Culture and the possibility to take a ride on the bicycles from the Danish EXPO Pavilion. Watch the presentation of Odense which is to be shown at EXPO 2010 in Shanghai.